One of the key elements of design in any visual art-form (including photography) is shape. Shape is defined by its perimeter/outline, and silhouettes are the purist and strongest of all shapes. For a successful image using silhouettes, you must remember that you are telling a story with shape only - often the other elements of design such as colour, texture, form are missing. Unable to rely on the full range of elements, the shapes in your images must therefore be easily identifiable. They must also have have unity yet variety, rhythm and movement, proportion and scale - and they must work together to create a visually interesting and balanced image. Successful silhouettes can take time to compose. After wandering through the beautiful Villa Borghese gardens in Rome, I made my way to the Pincio. This terrace offers a wonderful view of Rome over the rooftops towards St Peter's dome. 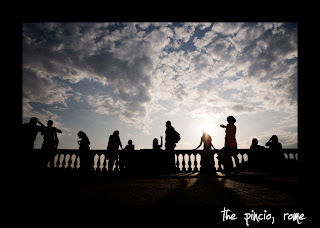 As I approached the terrace I identified the opportunity to create a succesful silhouette image as the strong sun was backlighting the people on the terrace. Rather than just shooting straight away, I waited until the people on the terrace were in positions that could be easily identified from only their shapes. 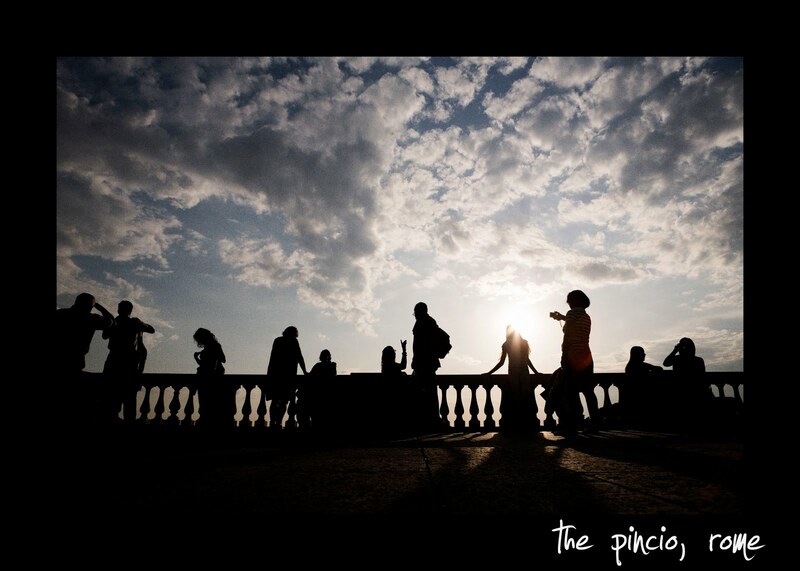 From left to right you can see someone covering their eyes to block the sun, someone with their arm up holding their camera, someone looking down at their lcd screen to review the images they have taken with their camera, two people looking down at the view in front of them, two people talking to each other (one gesticulating in conversation), someone posing for a photo, someone taking the photo, someone looking at the person they are with as that person takes a photo. So, as you consider using silhouettes in your images really look at the shapes in front of you. Are they able to tell the story you want to tell?